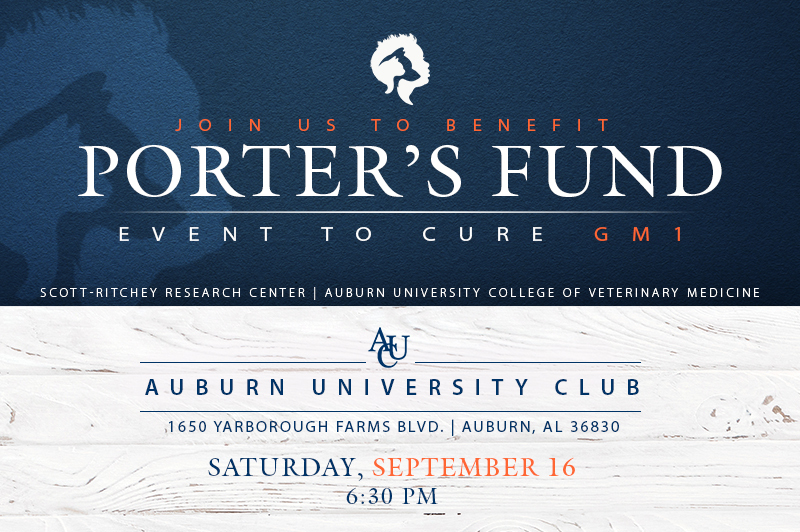 Porter’s Fund event, a Cure for GM1, will pay tribute to Alabama’s first known case of the rare genetic disease, and raise funds to support testing a cure led by scientists at the Auburn University College of Veterinary Medicine. Tickets are available for the annual fundraiser for the Scott-Ritchey Research Center, which will be held Saturday, Sept. 16 at 6:30 p.m. at the Auburn University Club, 1650 Yarborough Farms Blvd. 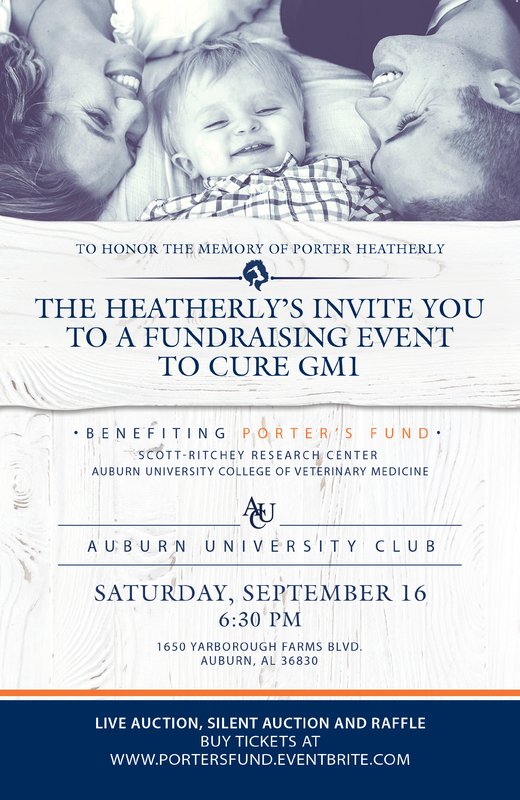 In 2013, Michael and Sara Heatherly, both Auburn alumni, received the devastating GM1 diagnosis for their son, Porter, at just four months old. Soon after, they learned of the ongoing research at Scott-Ritchey and believe that this research gives families hope. Porter Heatherly died on Nov. 10, 2016, but the fight continues. For more than four decades, Scott-Ritchey researchers have sought a cure for GM1 gangliosidosis, a rare neurodegenerative disease found in animals and humans. Today, Doug Martin, a professor in the college’s Department of Anatomy, Physiology and Pharmacology, and a team of Scott-Ritchey Research Center scientists, have found a cure for the disease. His research, and that of an international consortium, is a gene therapy to produce enzymes found missing in GM1 and Tay-Sachs-related diseases. Martin and his team have successfully extended the life expectancy of cats by more than five times compared to non-treated GM1 cats with the use of gene therapy, a non-harmful viral vector to produce enzymes missing in GM1 and Tay-Sachs-related diseases. The goal is human clinical trials, slated for 2018, at the National Institutes of Health. Funding is needed to pay for final tests. Individual tickets are $50 and sponsorships are available from $500. Advanced reservations are required for tickets and sponsorships, which are tax deductible through the Auburn University Foundation. For more information or to order tickets, click here. To learn more about the research, watch a recent video about Scott-Ritchey Research scientists’ research.